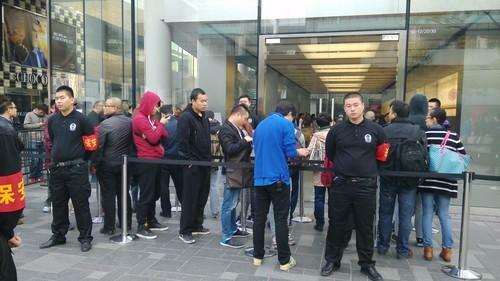 The line outside an Apple store in Beijing for the iPhone 6. Apple fans in Beijing lined up on Friday to get their hands on the company's newest iPhones, after waiting a month for the product to officially arrive in mainland China. "I'm very excited," said Li Simeng, a 20 year-old college student, who bought an iPhone 6 Plus. "I've been using Apple since the iPhone 4." About a hundred people waited outside the Apple store in Beijing's Sanlitun district before it opened Friday for the first day of official sales. Customers in China have had to wait a little longer for the phone to arrive, after government regulators finally approved the phone for sale in late September. 18-year-old Liu Yi, another student, was first in line at the Apple store, and ended up buying a 64GB version of an iPhone 6. "Apple has finally come out with a big-screen phone in the iPhone 6," he said. "I'm an Apple fan, I've bought every generation of iPhone." In China, Apple has instituted a reservation system to buy the iPhone 6, requiring customers to first place an order online. This has helped lessen the giant crowds that once congregated outside company stores at previous product launches. Demand for the iPhone 6 and iPhone 6 Plus is expected to be high in China, especially from existing Apple customers wanting to upgrade their phones to a bigger screen, according to analysts. Beijing customers who waited in line on Friday said it wasn't easy to make a reservation. "It took about 30 minutes of refreshing the Apple site before I could finally place a reservation," said a 28-year-old surnamed Su, who was happy to finally get his hands on the new iPhone. "When I was traveling in U.S. I tried to buy one, but they didn't have any more stock." Customers interviewed said they came to buy the new iPhones mainly for their bigger screen sizes and attractive design. Zheng Wenyu, who also owns an iPhone 5s, said he wanted to upgrade to the iPhone 6 Plus. "I've always been using Apple," he said. "I think it will be easier to watch movies with the new phone."